So how keen ARE you on fish? Interesting, the feedback - or rather lack of it - on the two recent posts I've done on fish, both of which have excited (if that's the right word) much less response than the ones I've done recently on meat and veg. I'm intrigued to know why this is. It's possible, of course, you didn't like the sound of either recipe (well, I did say the skate smelt of ammonia which is hardly a come on) But the chowder was actually pretty nice. Does this mean you're not really that keen on fish? And is that because you don't like the bones or the smell or don't really know what to do with it? Trout, for example, is a really thrifty buy (see the newspaper-wrapped trout recipe in the Frugal Cook book which is easy, delicious and fun). Tinned sardines, mackerel and tuna are still cheap despite the recent price rises. Healthy as well. Frozen prawns are great value, especially the little North Atlantic ones, as are frozen white fish fillets - great for a fish pie. And you can actually make quite a tasty fish stew or chowder with those compacted frozen fish 'steaks' which have the advantage of no skin or bones. So do tell - I'd love to know. If you're a) not a haggis-lover, b) haven't decided what to cook tonight but feel like something vaguely Scottish and are c) reasonably near the shops, here's an idea. It was prompted by a reduction on a pack of smoked cod in Somerfield yesterday which made me think of making Cullen Skink. Not that I could remember exactly what went into Cullen Skink but I bought a couple of leeks, a potato and a carton of soy milk (my husband is dairy-intolerant) and hoped for the best. I was just bemoaning the lack of parsley to finish it off when I remembered I had the tail end of a pack of watercress which proved a very good addition. As did a few shavings of parmesan. The result: more of a chowder rather than a Scottish fish soup but none the worse for that. Serves 2-4 depending whether you're eating anything else. Peel the potato and cut into smallish cubes. Cover with cold water, bring to the boil and simmer for about 10 minutes until the potato is just tender. Meanwhile trim, wash and finely slice the leeks then give them another rinse. Heat the oil in a heavy-bottomed saucepan or casserole, add the butter then tip in the leeks and stir. Put a lid on the pan and cook for 3-4 minutes until the leeks start to soften. Add the cod or haddock fillets, pour over enough milk to cover, bring up to simmering point then leave over a low heat for about 4-5 minutes until the fish is cooked. Remove the fish with a fish slice and set aside. Tip the potatoes and about 100ml of their water into the leeks and add the watercress or parsley. Leave over a low heat while you remove the skin and any bones from the fish then return it to the pan and warm through. Check seasoning adding salt (it should only need a little, if any) and pepper to taste. Serve in warm bowls with a little shaved or coarsely grated parmesan if you have some and fancy it. Have you ever cooked an oxtail? I hadn't until a couple of years ago. It just looked too alien and scary, too fatty, too much as if it would never cook through. But I had eaten it and enjoyed it so gave it a try and it was fab. Cover the oxtail in water, season well with salt and leave to soak for 2-4 hours. Drain off the water, pat the meat dry, and dust each piece in seasoned flour. Cut up the bacon into small pieces, heat 2 tbsp of the oil and fry the bacon until beginning to brown then remove from the pan with a slotted spoon. Brown the meat well on all sides and remove that too then add more oil if necessary and cook the onions until beginning to soften, adding the sliced carrots and celery after 3-4 minutes. Stir in the finely chopped garlic, paprika, allspice and tomato paste then add the wine, port, if using and stock or water (or stock and beer, if using porter). Add the herbs tied together with a piece of string or cotton and the meat and bacon, ensuring the liquid covers the meat (if not, add a bit more wine or stock) and bring to the boil. Turn the heat down as low as you can and simmer on the hob or in a very low oven for about 3 1/2 to 4 hours. If serving straight away skim off as much fat as possible and add a little more red wine (don't top it up if you've used beer - it'll taste bitter) and reheat. Or leave overnight and the fat will be easier to spoon off. You can take the meat off the bone if you like. Check the seasoning, adding salt and pepper to taste then serve with creamy mash (or baked potatoes) and carrots. In the case of Sofra restaurants they don't even go through the pretence of saying the service is 'optional', they charge it and then charge service on the service charge. There was a lot of adverse publicity a while ago about this and restaurants stopped doing it for a while but in these credit-crunched times they're obviously up to their old tricks again. So look out for it, don't pay it and let's name and shame the restaurants who do it! 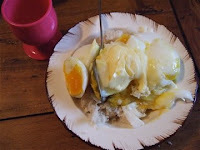 Twelve months ago today I started blogging as The Frugal Cook. I can't claim credit for the idea - it was my publisher's who thought it would be interesting to chart my efforts to cut back and eat more thriftily. I remember wondering if I'd have anything to say (hah!) and whether I was mad taking on the extra workload. (I was!) But it's been nothing but fun, so much so that I now have two other blogs on subjects that interest me - The Cheeselover and Credit Crunch Drinking. The reason it's worked so well is thanks to all of you. All blogs need an audience, preferably a vocal one and the recent response to such topics as frozen veg and food for flu have shown that there's a wealth of expertise to share. The most important thing I've learnt is that you have to shop and cook in a way that suits your own time and temperament. Some people manage to plan a week - or even a month - ahead but I find that I always end up wasting food when I do. Plans change, we go out to friends, they come round to us. I spend less when I plan two to three days ahead but I'm lucky enough to work from home. You also have to keep your wits about you far more than you did even a year ago. The incredible offers on some products mean that prices may suddenly soar on others. The received wisdom that produce that food that is in season is cheaper than food that is not and that loose produce is cheaper than pre-packed isn't always the case these days. Offers of 50% off are not always as good as they seem. So it seems well worth while carrying on. If you have a moment let me know what you think of the blog - publically or privately (to fibeckettATliveDOTcom) Is it useful to you? Could it be more so? Are there any subjects you think I should tackle (I've had a couple of good suggestions recently). Just let me know. Prior to The Great Lurgy (from which I am fully recovered, thankyou) I'd picked up a couple of interesting buys I was going to cook up and report on. They got transferred to the freezer but I thought I'd have a crack at them this weekend to alleviate the tedium of tackling my tax return. The first was what are peculiarly called 'skate knobs' (don't snigger) the sweet little nuggets of fish you find by the bone of skate wings. They're a real delicacy which you never find in supermarkets, rarely in fishmongers and just occasionally on a market stall and they're amazingly cheap. I paid £3.82 for 700g, easily enough for three. I did very little to them. I simply fried them for a couple of minutes in a mixture of olive oil and butter, add a small splosh of dry white wine, let it bubble up and reduce then added a couple of tablespoons each of chopped capers and parsley and heated the whole thing through. Total cooking time, 5 minutes. We had them with a few new potatoes and the first of the season's purple sprouting broccoli. A real feast. They would also have been nice deep fried*, I think or in an upmarket fish pie with prawns. They have something of the taste of scampi or scallops but not quite the same firm texture. Do look out for them or see if your local fishmonger can get them for you. Now this is off-topic but you'll have to indulge me as I'm still not doing much food-buying or cooking. But I have been trying to book a trip to France online and need to have a moan about Ryanair. If you look at their site a flashing sign will tell you they're offering 1 million seats for £1 one way (until Sunday night). "That sounds a good deal" you might think (although you are probably already sceptical if you've endured the pain of booking with Ryanair before). So it's going to cost £4 for the two of us, right? Er, not quite. The key phrase is 'one way'. That seems to mean whatever flight you chose one leg will cost £1 and the other will include taxes and fees. Which amounts, in the case of our flight from Bristol to Beziers, to a princely £64.06 - £52.08 unspecified taxes and £11.98 insurance, wheelchair levy and aviation insurance. This is new. Normally the total taxes are about £30 to £40 on this flight so how come it's more than this one way? And I would have thought Ryanair would cover its own insurance costs. Most businesses do. I don't so much object that Ryanair is charging us £44 each to take us to France which is after all cheaper than going from Bristol to London but their disingenuousness in pretending that it will cost a couple of quid. And for penalising not people like us who are lucky enough to have family over there but families who are spending their hard earned cash on a holiday and having to pay all these extra charges. The problem is the 'extras' are always changing. Subtly the fares creep up without any fanfare yet still these incredible offers are splashed all over the papers. Does Trading Standards have anything to say about this? Apparently not. The plus side - apart from the opportunity to re-watch bad films and old episodes of 'Allo, Allo - is that this is an impeccably frugal and healthy start to 2009. But I certainly look forward to getting my appetite back. For each person you need 2 good fresh eggs and a thick slice of traditional white English bread (a tin loaf, preferably a day old) Cut the crusts off the bread and break it by hand into rough crumbs. (See above. You don't want fine breadcumbs) Soft boil the eggs for about three minutes if you keep them at room temperature, four, if you've taken them straight from the fridge. Put the crumbs in a large cup or a small bowl, scoop the eggs out of their shells, add a chunk of soft butter - on top of the egg so it melts - then chop the whole thing together with a teaspoon. Season with salt and white pepper if you have it. If not black will do but that's not the way my mum made it. And eat as soon as possible. Oh, and don't expect too much. It's slightly soggy, very bland but immensely comforting . 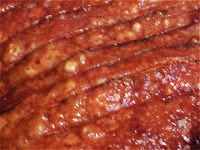 . .
Like other so-called 'cheap' cuts pork belly has gone up significantly in price over the last year or so since it became a must-have main course in gastropubs and other modern British restaurants. But it's still a reasonable deal. I paid just over £13 for a 2.5kg piece in St Nick's Market in Bristol on Saturday and it produced 10 helpings (everyone had seconds!) with two more for leftovers today. I could have paid less but it's worth buying pork that hasn't been anywhere near a vac-pack if you want to get decent crackling. I stretched it with slices of black pudding, a big tray of roast veggies including potatoes onions, carrots and parsnips and some steamed Savoy cabbage which made everyone's plate look loaded even though they didn't have a vast amount of meat. It's also very good with mashed potato mixed with equal amounts of puréed unsweetened Bramley apples, a German dish called poetically Himmel und Erde (heaven and earth). Transfer the joint to another roasting tin, turn the heat back up to 230°C/450°F/Gas 9 and continue cooking until the crackling is good and crisp. Set aside and rest for 10 minutes (but don’t cover or the steam will make the crackling soft) Carefully pour any accumulated fat off the first roasting tin, pour in half the remaining stock and work round the tin with a wooden spoon to incorporate all the caramelised meat juices. Add more stock if needed to get a thin but tasty gravy and season with salt and pepper. Heat the remaining oil in another pan and fry the black pudding slices on both sides until crisp. Carve the meat into chunks and serve with roasted root vegetables or potato and apple purée as suggested above and some lightly cooked, buttered brussel tops or cabbage. I don’t know if you ever get the Financial Times but for some years now at this time of year they’ve run a great cut price restaurant promotion. It started some years ago as 'Lunch for a fiver' then the price crept up and for a few years, at the height of the boom, the idea seemed to be running out of steam. Now it’s been revived with a clever twist that benefits all parties - the customer, the restaurant and the FT. This is the deal. You take a friend to lunch (and in some cases dinner) at one of the restaurants that is taking part in the promotion. They take 50% off your total food bill then you pay £5 for the friend (or obviously split the bill between you). You also have to present 3 tokens from the FT - there are two in the Weekend Edition which costs £2.30 and one in the daily edition which costs rather less which makes your second meal around £8 plus drinks. Obviously the better the meal the more the deal is worth and the advantage of the FT promotion, unlike those run by other newspapers, is that some seriously good restaurants take part thanks to the clout wielded by the founder of the scheme, the FT’s restaurant critic, Nicholas Lander. Ones I would single out include Bibendum, Chez Bruce, L’Anima, Le Café Anglais, Moro, Quo Vadis and Ransome’s Dock in London, Bordeaux Quay in Bristol, The Vineyard at Stockcross, Anthony’s in Leeds and the wonderful Walnut Tree just outside Abergavenny. You can find the full list here. The promotion starts next Monday and runs till February 13th so if you want to take advantage I’d pick up a copy of the paper this weekend for your first two tokens. Those of you who have been following the fevered debate on the virtues (or otherwise) of Marmite may require proof that I have been as good as my word and knocked up a Marmite and cucumber sandwich. So here it is! I realised there were many possible permutations. White or brown bread (I chose white), butter or no butter, how much Marmite (a light smear), how thickly the cucumber should be sliced (thinly, IMO) and whether it should or shouldn't be peeled (it should, I think). I was going to title this post Pizza the action, but thought it was just too painfully bad a pun. But it slipped out anyhow . . . Anyway, for those of you who don't subscribe to Martin Lewis's excellent moneysavingexpert.com newsletter (and if you don't, you should) Pizza Express and Zizzi are both offering 2 for 1 deals on main courses this month. In Pizza Express's case you get the most expensive pizza free which is really good. 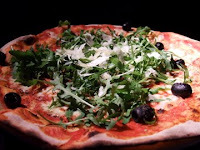 I go back a long way with Pizza Express. I loved it when it first opened then went off it in a big way as the pizzas seemed to shrink and shrink but it's back on form currently. Zizzi I'm not mad about but a deal's a deal. The prize for silliest idea of the year so far (admittedly we're only 7 days into 2009) has to go to the food and beverage department of the Dorchester which has dreamed up a Marmite afternoon tea. The Marmite component apparently consists of Marmite and cucumber sandwiches which sounds pretty yukky to me. And that seems to be it. Price £31.50 per person. Minus service, I presume. I suppose if you're rich enough to go to the Dorchester for tea £31.50 is peanuts but it seems shockingly bad value to me, even by London standards. Here's a suggestion. Go off to your local supermarket or corner shop and buy a packet of crumpets. Toast them really, really well (there's nothing worse than a soggy crumpet), slather them with butter and spread with a thin smear of Marmite. Cost per head (assuming you have butter and Marmite and eat two crumpets) about 31.5p - 100th of the price of the Dorchester tea. BTW you know this big thing about Marmite lovers and loathers - the idea that everyone falls into one of two camps. I really don't buy it. I actually quite like Marmite - especially on crumpets - and Ryvita crispbread, now I come to think of it - but I never crave it. On the other hand I don't like Vegemite or other Marmite substitutes which is annoying as it really seems to have gone up in price, particularly with these new squeezy bottles. What about you? And have you ever found a good low cost alternative? I don't normally buy frozen broccoli but found a 1 kilo bag for a pound in Somerfield yesterday which was less than a third the £3.33 the store was charging for a kilo of fresh broccoli. In fact it was even better value, arguably, given that there weren't any huge stalks though as I've mentioned before there are things you can do with those. It's also probably more healthy given that it was frozen soon after picking and hasn't been lying around in a storeroom for weeks. BUT - and of course there's a but - it doesn't have the taste or texture of fresh broccoli, especially broccoli that's locally grown. The worst thing you can do IMO is to follow the pack instructions and cook it in boiling water for 5 minutes by which time any remaining taste will have disappeared and it will have been reduced to an unappetising mush. In fact I wouldn't put water anywhere near it. 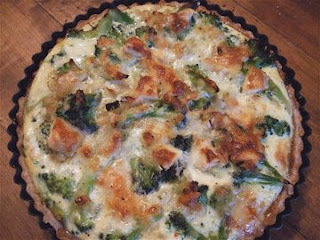 I tried making a broccoli quiche with some assorted bits of leftover cheese in the fridge which was reasonably successful. 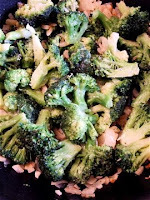 I sweated off a chopped onion, added a large clove of finely chopped garlic and thawed the broccoli just enough to chop it into smaller florets (see top pic) then carried on the usual way. If I was making it again I'd use a stronger cheese such as Stilton or a mature cheddar or extra Parmesan. Looked nice though. Last night I stir-fried a batch - again thawed for 10 minutes or so until I could slice it - adding a little crushed garlic, grated ginger and light soy sauce and that again tasted perfectly nice though admittedly more of the seasonings than the vegetable. I reckon you could also make a decent soup whizzed up from briefly cooked frozen broccoli, frozen peas and spring onions if they were cheap enough (they're a ridiculous 85p a bunch locally at the moment) and a good bit of parsley or mint. So - no water and strong accompanying flavours. That seems to be the answer. Do you use frozen veg (apart from peas) and if so how do you find it's best to cook them? Offers that would tempt me (assuming they're actually available*) include a £1.33 reduction on Kellogg's Fruit and Fibre cereal from £2.33 to £1 and the New Covent Garden's soups down from £1.97 to £1. But even at £1 you can find cheaper ketchups than Heinz and make a pasta sauce for less than the £1 Asda will charge you for a jar of Loyd Grossman Tomato and Basil sauce. My daughter who lives in York tells me this is no big deal and that Poundland (to which she is devoted) has similar offers. I'll have to check out our local branch. * I say this because one of you has reported she couldn't find any of the advertised offers in her local Asda. As you'll see from the comments below they don't actually guarantee to have them available which is more than a bit cheeky. Most of my new recipes these days are inspired by an ingredient that needs using up. So it was in the case of this substantial soup (more like a stew, actually) which I thought would make the best of a batch of really tasty goose stock. Like all recipes it can be fiddled around with depending what you have available. If you haven't got bacon use chorizo or up the amount of pimenton. You don't have to use a carrot. You could use celery if you have some. You could use duck or turkey stock instead of goose - or even vegetable bouillon powder. Shredded cabbage makes a good substitute for parsley or you could, as I did, use both. (You need something green, though, otherwise it is a bit unrelievedly brown.) I also added a bit of fried up sliced chorizo as I had some lying around but you could of course make it entirely vegetarian. Heat the olive oil in a deep casserole or heavy-bottomed saucepan. Add the streaky rashers and cook until the fat starts to run. Add the chopped onion and carrot, cover the pan and cook over a low heat until the vegetables start to soften. Stir in the garlic and cook for a minute then stir in the paprika. Add the chopped chestnuts and lentils then add the stock and bring to the boil. Lower the heat and simmer the soup for about 20 minutes until the lentils are tender. Add the shredded cabbage leaves if using and continue to simmer until they are lightly cooked. (If you’re using parsley instead or as well add that 3-4 minutes before the end of the cooking time.) Add a little extra stock if you need it and season to taste with salt and freshly ground black pepper. Enjoy and a Happy New Year to you all!